Sometimes you find two colours that just go together beautifully. I discovered that Peekaboo Peach and Basic Black are just gorgeous together. As a result I've made quite a few projects featuring those two colours in the last few weeks. I think any of the pastel colours would go really well with our Basic Black ink; have a look at our range of Inks to see what you like. After Sale-a-bration is over I'm going to concentrate on making projects with things other than hot air balloons - sorry! I just love the Lift Me Up stamp set and it has become a bit of a focus. 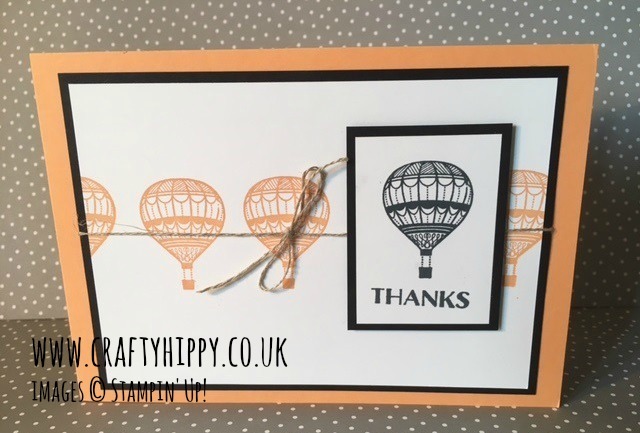 Back tomorrow with more Stampin' Up! ideas, happy stamping!